The Su-25T (Tankovy) is a dedicated antitank version, which has been combat-tested with notable success in Chechnya. 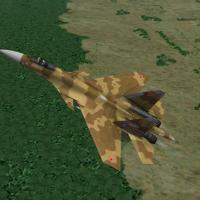 The design of the aircraft is similar to the Su-25UB ( unification of 85%). The variant was converted to one-seater, with the rear seat replaced by additional avionics. It has all-weather and night attack capability. In addition to the full arsenal of weapons of the standard Su-25, the Su-25T can employ the KAB-500Kr TV-guided bomb, KH-58 ARM, R-73, MPS-410 ECM Pod and the semi-active laser-guided Kh-25ML. Its enlarged nosecone houses the Shkval optical TV and aiming system with the Prichal laser rangefinder and target designator. It can also carry Vikhr laser-guided, tube-launched missiles, which is its main antitank armament. For night operations, the low-light TV Merkuriy pod system can be carried under the fuselage. Three Su-25Ts prototypes were built in 1983–86 and 8 production aircraft were built in 1990. With the introduction of a definitive Russian Air Force Su-25 upgrade programme, in the form of Stroyevoy Modernizirovannyi, the Su-25T programme was officially canceled in 2000. The Su-25SM (Stroyevoy Modernizirovannyi) is an "affordable" upgrade programme for the Su-25, conceived by the Russian Air Force in 2000. The programme stems from the attempted Su-25T and Su-25TM (aka Su-39) upgrades, which were evaluated and labelled as over-sophisticated and expensive. The SM upgrade incorporates avionics enhancements and airframe refurbishment to extend the Frogfoot's service life by up to 500 flight hours or 5 years. The Su-25SM's all-new PRnK-25SM "Bars" navigation/attack suite is built around the BTsVM-90 digital computer system, originally planned for the Su-25TM upgrade programme. Navigation and attack precision provided by the new suite is three times better of the baseline Su-25. A new KA1-1-01 Head-Up Display (HUD) was added providing, among other things, double the field of view of the original ASP-17BTs-8 electro-optical sight. Other systems and components incorporated during the upgrade include a Multi-Function Display (MFD), RSBN-85 Short Range Aid to Navigation (SHORAN), ARK-35-1 Automatic Direction Finder (ADF), A-737-01 GPS/GLONASS Receiver, Karat-B-25 Flight Data Recorder (FDR), Berkut-1 Video Recording System (VRS), Banker-2 UHF/VHF communication radio, SO-96 Transponder and a L150 "Pastel" RWR. The R-95Sh engines have been overhauled and modified with an anti-surge system installed. The system is designed to improve the resistance of the engine to ingested powders and gases during gun and rocket salvo firing. The combination of reconditioned and new equipment, with increased automation and self-test capability has allowed for a reduction of pre- and post-flight maintenance by some 25 to 30%. Overall weight savings are around 300 kg (660 lb). Su-25SM weapon suite has been expanded with the addition of the Vympel R-73 highly agile air-to-air missile (without helmet mounted cuing) and the S-13T 130 mm rockets (carried in five-round B-13 pods). Further, the Kh-25ML and Kh-29L Weapon Employment Profiles have been significantly improved, permitting some complex missile launch scenarios to be executed, such as: firing two consecutive missiles on two different targets in a single attack pass. The GSh-30-2 cannon (250-round magazine) has received three new reduced rate-of-fire modes: 750, 375 and 188 Rounds per Minute. Like the Su-25T it can carry the MPS-410 ECM Pod. The eventual procurement programme is expected to include between 100 and 130 kits, covering 60 to 70 percent of the Russian Air Force active single-seat fleet, as operated in the early 2000s. The Su-25SM has been operating over Syria in 2015. 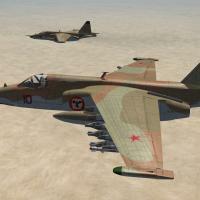 TLR/ ATR weapons rack can only carry a maximum of 6 LGR missiles but the Vikhr rocket launcher for the Su-25T carries 8. As a work around there are two 8 tube ATR launchers that are different 'rack specific' weapon stations but have the exact same position. One of the launchers holds 6 LGR the other holds just 2. The missiles are positioned on the ATR racks so the one that holds 2 fills in the empty tubes of the ATR that holds 6. The Loadout.ini will loads both racks correctly but it is not possible to manually load them and get 8 rockets in the tubes, you will only get 6 if you do it manually. Included in the ‘optional’ folder is a modified NATO Fighters 5 1986 Red Storm (WP) Campaign to include the Su-25T. 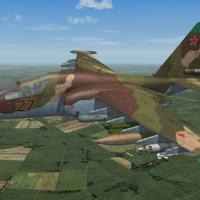 It will show up an extra campaign named “861019 Red Storm (WP) Su-25T” and will not affect any of the other NATO Fighters campaigns. The Russian answer for a small carrier such as the Successful Boeing 737 series. May work in SF1 but if it doesnt work,ive no intention of making it for sf1. Set as a seperate nation ....called Airliner. Template tidied up a little. To follow soon..
new textures added....slightly higher res. complete New landing gears front and back..
some areas of original texture removed due to being remade or repainted. click yes to add folders into required main folders. no need for anything else if you have done this properly. only for free distribution with credits given. If Ive forgotten something,please contact me via the download support .. The Sukhoi Su-25 (NATO reporting name: "Frogfoot") is a single-seat, twin-engine jet aircraft developed in the Soviet Union by the Sukhoi Design Bureau. It was designed to provide close air support for the Soviet Ground Forces. The first prototype made its maiden flight on 22 February 1975. After testing, the aircraft went into series production in 1978 at Tbilisi in the Soviet Republic of Georgia. Russian air and ground forces nicknamed it "Grach" ("Rook"). - Paulopanz: new temps (soon avalaible), new skins, decals etc. This is the old Florian outstanding model revamped, a big upgrade is in the work by Martin. I think it's so good that we can't wait for the new one to fly. A what if Parani skin will be posted in dedicated section soon by gentle request. So this is my birthday (i'm so old ...) present for you all my friends! and production of the company's single-seat multi-purpose jet fighter prototype. so the continuation of the Su-27 NATO code, known as the Flanker-F.
Su-37 in April 1996 in Zhukovsky near Moscow for the first flight Flight Test Center. it in Su-37 Terminator package. Contained in this package is the 3D Studio Max model (Release 7) of an SU-25. It includes maps, templates, and models for use as a "getting started" package. There is no support for this package and it's completely freeware, feel free to distribute to whoever would like to get started in Strike Fighters modding. Keep in mind that I only converted this fine mod into "out of the box" SF2 compatible add-on and uploaded it to help reduce the conversion workload! The guys above did all the hard work!